When I think about summer desserts, I think about something refreshing. Usually something citrusy. Since I’ve been on this whole strawberry/lemon kick, I decided to cook up Lemon Shortbread using my favorite pie filling brand – Lucky Leaf. The folks at Lucky Leaf were kind enough to send me some tasty pie filling and other “mats” to bake up this tasty summer treat. Add eggs singly and beat until light and fluffy. Add flour and lemon rind. Put ½ dough in prepared pan and cover with pie filling. Drop remaining dough over top. Bake at 325°F for 45 minutes or until golden brown. 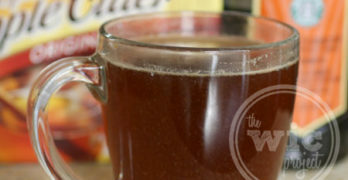 Stir until combined and smooth (mixture will be thick). With a fork or small spatula, drizzle on top of cooled shortbread. I’ll start off by saying that if you aren’t a lemon fan, that’s totally OK. You can use another Lucky Leaf Pie Filling instead of the Lemon Pie Filling I used. This was the first time I’ve had a chance to bake with the lemon filling and after tasting the filling by itself, it’s my second favorite pie filling from Lucky Leaf (the first being their Strawberry Pie filling, which I incidentally used when I made Strawberry Lemonade Cheesecakes.) 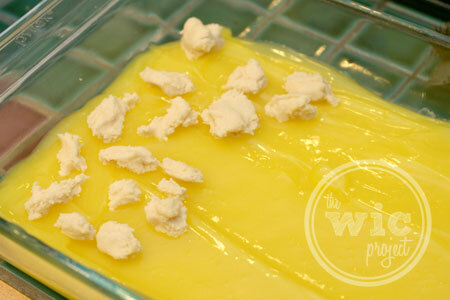 The Lucky Leaf Lemon Pie Filling is perfectly balanced in lemony flavor and isn’t too sweet or too sour. 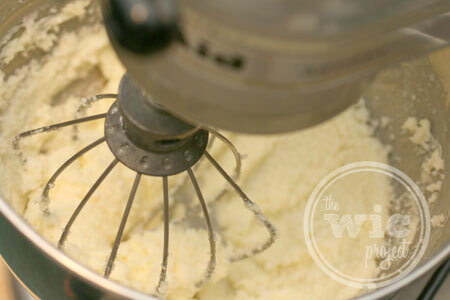 To make our Lemon Shortbread, we start off by making the shortbread dough. First, by creaming together the butter and sugar, followed by the eggs (one at a time) and the flour and lemon rind. Next, we split the dough in half and press half of the dough into the bottom of our baking pan. 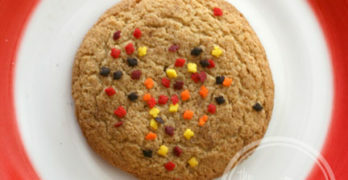 The dough is slightly sticky, so you can add a bit of flour to your fingers to keep it from sticking. Once you have your shortbread dough in the pan, evenly spread a can of Lucky Leaf Premium Lemon Pie Filling (or any other variety of tasty pie filling.) 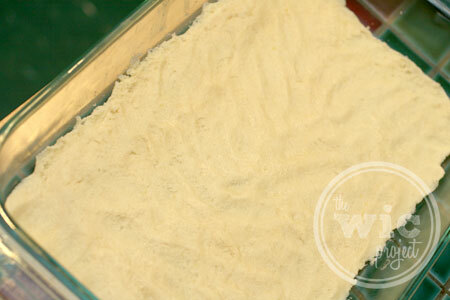 Use the rest of the shortbread dough to create dough drops on top of the pie filling. Bake in the oven for about 45 minutes (until the top dough starts to turn golden brown) then allow it to cool. I refrigerated my lemon shortbread which made for a super refreshing treat on this sunny afternoon. The shortbread was wonderful and with the top and bottom layers, it was really like a shortbread, lemon sandwich. So good. If you’re looking for other summer treat ideas, Lucky Leaf has some tasty “no-bake” recipes you can try, including the Rasberry-Peach Trifle and No-Bake Blueberry Lemon Cheesecake Trifles. What are some of your favorite summer desserts? 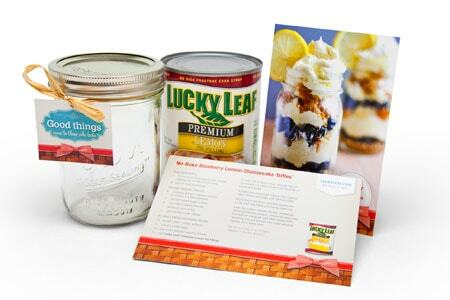 One winner will receive a Lucky Leaf prize pack which includes a can of Lucky Leaf pie filling, a recipe card, a mason jar and carrier to share your summer treats. Ilove peach cobbler and a fresh fruit salad. Fresh fruits and carrot cake! My favorite summer desserts of Sherry Trifle and Strawberry Shortcake. My favorite summer desserts are Tropical Trifle and a jello dessert using orange sherbet. I love strawberry lush cake in the summer. Cool whip, crushed pineapple, strawberries and vanilla pudding on an angel food cake. YUM! I love blueberry anything in the summer!! My other favorite is Strawberry Shortcake-so delicious!! I love Key Lime Pie, Cherry Cobbler, and Rhubarb Pie. Homemade maple walnut ice cream. homemade ice cream with fresh strawberries! I love this recipe and lemon. 🙂 Thanks for sharing. I love any fruit cobblers and frozen yogurts. I love sherbert Ice cream and banana creme pie! I love the deserts that involve pudding, some sort of whip cream/cream cheese, and crust. And I can’t forget about Italian Ice….that is so refreshing during the summer! I love lemon pie,blackberry clobbler! Ohhh this sounds wonderful, I love Lemon Desserts. Thanks so much for the recipe! 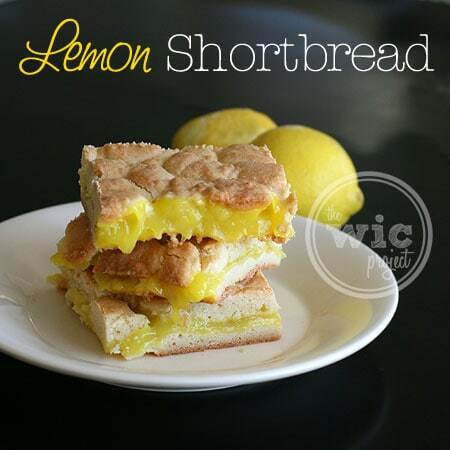 Lemon Shortbread -I never thought about using Lemon. I will have to give this recipe a try. It certainly looks good. You know what – this is not just for Summer! Some folks get tired of all the “sugar and spice” of the holidays and these would be a wonderful break!